Linda’s prints and paintings are expressions of joy and pleasure. She particularly loves exploring the shapes, forms, colours and textures of landscape and seascape. She often sketches en plein air then works with these drawings, together with her memories and the sensations of that day, to create a finished piece of work in her studio. She enjoys the pursuit of an idea and exploring this through a printmaking process or oil paint to create a finished work. She studied History of Art at the University of Edinburgh (MA Hons) and Fine Art Printmaking at the University of Wolverhampton (BA Hons). 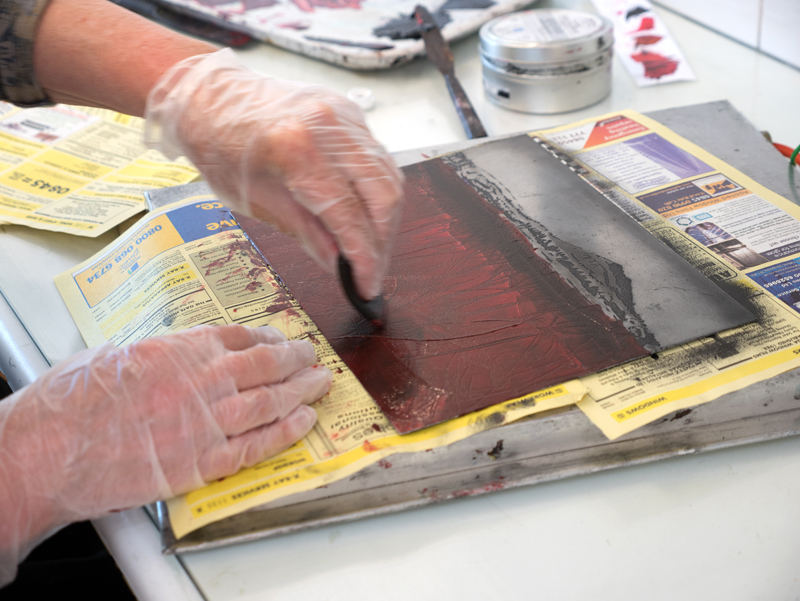 Significant short courses include printmaking at ‘New Grounds’, Albuquerque, New Mexico, which was part of an Arts Council funded study trip researching Route 66. In 2017 she had an etching ‘On bare mountain’ selected by the Victoria and Albert Museum for their permanent collection. She also won the WSA Elsie Holland Prize for outstanding work. Her drypoint print ‘From here to there’ is held in the Printmakers Council archives and it was chosen to appear on the artuk.org site’s database for UK public art collections. In 2018 an etching was on show at the Mall Galleries, London as a shortlisted artist for A & I Artist of the Year Award. In 2018 she was elected an Associate Member of the Royal Birmingham Society of Artists (RBSA). She is a member of the Printmakers Council, Birmingham Art Circle and Wolverhampton Society of Artists. She regularly exhibits at the RBSA and further afield. 2007Arts Council Travel Grant to research fascinating old gas stations, motels, diners and signs, investigating the rusting, fading image of the legendary road, Route 66, in Arizona and New Mexico in the USA and to create solar prints in Albuquerque. 2006 Arts Council Grant for Imagetextimage group exhibition, Lighthouse Media Centre, Wolverhampton and poetry performance. 2017 Wolverhampton Society of Artists Elsie Holland prize for outstanding artwork.